If I do what I consider a regular workout, for example bike 20 and run 3 after or maybe it’s just a run day and I do 6-8 miles or less, I’ll use one scoop. This usually keeps me pretty loose for the next days workout. Now, say it’s a Saturday or Sunday & I’m getting a super long workout in, say 50 miles on the bike or a long swim, I’ll do the prescribed 2 scoops… Works wonders! After I finished my 1/2 Ironman (or the 69.1 since the swim was cancelled), I did 2 scoops immediately following the race and a couple hours later, I did another 2 scoops. The next day, I wasn’t sore at all, muscles felt great!! * 1 entry for saying how you would use it on my blog. 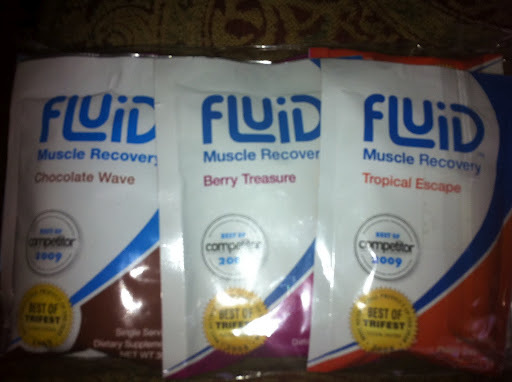 * 1 entry for liking Fluid on Facebook and saying so on my blog. And you must live in the United States to be eligible. One lucky winner will be drawn! And keep an eye out because word on the street is, the Fluid guys are about to release a new product soon… I hear it tastes great and works awesome!! I know I’m stoked!